I suppose I’ve always been a gadget freak. Now that smartphone and tablets are here, the need to carry several distinct gizmos no longer exists. The old gizmos I once carried, however, are still lingering in the boneyard. Come have a peek! Why do I keep these things? I dunno. Probably because I paid way too much money for them in the first place! Figure 1. The Sharp Wizard, my first mobile gizmo. 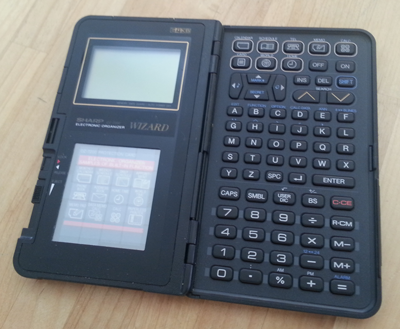 The Sharp Wizard was my first, real mobile gadget. I got it because a friend at church had one. We needed to meet up, so he whipped out this billfold-like device, types a few items to schedule the appointment, then flips it shut and puts it away. “What was that?” I inquired. He let me toy with the Wizard for a few minutes. I was hooked. It was far more modern than carrying a datebook, something I despised. On the downside, the keyboard was alphabetic, not QWERTY. (They had a QWERTY model, but it kept selling out, so I settled for the alphabetic Wizard.) The software was static, so you pretty much were stuck with what came with the device. Also, the PC interface sucked. You couldn’t really get the information out of the device and onto your computer. But the Sharp Wizard was a step in the right direction. Figure 2. The Palm III. 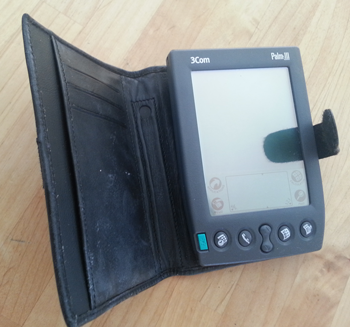 A leap forward was the Palm Pilot. 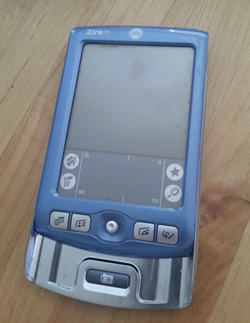 The first model I bought was the Palm III, shown above. It’s quasi-touchscreen interface was a dream. It also featured a docking station that automatically synchronized information with your PC. That was really cool. The only thing the Palm was missing was a telephone. In fact, I wanted it to be a phone very badly. But that technology was still about 10 years in the future. Figure 2. My first iPod. 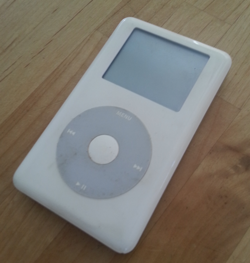 Not the original iPod, but the second or third model. Some time around 2002 I bought an iPod. It was an odd purchase for me, mostly because I’m not a mobile music person. I’ve never owned a walkman or even a boom box. I listen to music when I work in the wood shop, but not with headphones. No, I think I bought the iPod because it was cool (of course), but also because the kids wanted to listen to music. In fact, they used it far more than I did. That iPod shown in Figure 3 eventually died. It was probably the battery that went. But I admired the device for its simplicity, so I kept it. Never mind that today’s iPods are far smaller and give more of a punch — or that your phone or tablet makes the ideal mobile music device. Figure 4. The Palm Zire. The Zire was faster and more flexible than the Palm III, letting me draw right on the screen. It was a great companion on long airplane trips. But eventually it became less necessary as the smartphone era dawned. Now it, like the other gizmos, lay dormant in the boneyard, waiting for me to blog about them once again.